at 10.45 with a Moment of Remembrance for all who fought and died in 1745. N.B. Photographic details of all re-enactments in previous years to 2018 are linked HERE and press reports appear below. This was the year the East Lothian Battles Weekend, convened in partnership with Scottish Battlefields Trust, returned to Prestonpans for our 10th Re-enactments. The highlight was the Call to The Clans that Came out With The Prince on September 21st 1745 to Parade and Dedicate a new Memorial Table that lists the Clans concerned.The Lord Lieutenant was there to Welcome The Clans and the largest ever Encampment & Re-enactments followed on Saturday & Sunday 15th/ 16th September. at Newhailes House with the present Duke of Somerset attending. Modest commemorations were held in Prestonpans involving battlefield walks and wreath laying across the community..
CLICK HERE for details of the 2017 Commemorations. 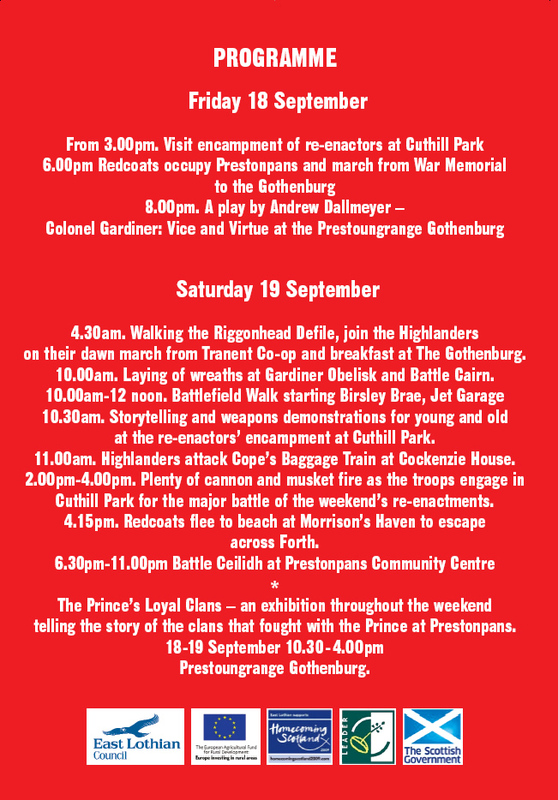 These 9th Re-enactments were the last before Prestonpans joins the Easat Lothian County Triennial Cycle. At each of the three venues [Dunbar 1650/ Pinkie Cleugh 1547 & Prestonpans 1745] every third year and modest commemorations in the intervening years. The project is led and co-ordinated by the Scottish Battlefields Trust which was established at the 4th National Biennial Symposium convened by the Trust. 2015 was also the fateful year when the twin towers at Cockenzie Power Stations were demolished. CLICK HERE for Plenty of action at Greenhills before those two towers came down! The 8th Annual re-enactments once again attracted a large audience and offered activities throughout the weekend, including the traditional Riggonhead Defile Walk on Saturday dawn. The encampment was a magnificent opportunity for visitors to gain an extended understanding of the circumnstrances leading up to the battle as well as to meet with the re-enactors personally - most especially General Sir John Cope. The closing moments on Sunday were shared with the Coastal Regeneration Alliance which is fighting to protect the future of Greenhills where the re-enactments now take place from unacceptable development plans. The year saw the continuation of the touring by the Battle Tapestry including 2 weeks in St Nazaire/ Pornichet and re-enactments nationally by the Alan Brecks including Edinburgh during The Fringe season. In September's annual re-enactments the skull of Captain Clarke of Hamilton's dragoons was exhibited at Prestongrange Museum. CLICK HERE for the 3rd National Biennial Symposium on Scottish Battlefields: Gladsmuir? The year saw the continuing touring of the Tapestry as reported at its own website linked HERE plus a fine new paintings exhibition and the annual re-enactments commencing in Haddington and Musselburgh with the full scale battle scenes in Cuthill Park on the Staurday and Sunday. The year saw an even greater pattern of celebrations and re-enactments! It began in June with the 2nd National Biennial Conference on Scotland's Battlefields and from July 26th/ September 26th saw the 104 metre Prestonpans Tapestry tour the Highlands and East Coast in the run up to the traditional September battle conflict. Two 'new' occasions were the Highlanders March from King's Park to Duddingston and the Landing of Cope's Redcoats at Dunbar. Cuthill Park once again hosted a weekend encampment, drills and battle conflict on both Saturday and Sunday. The 2009 annual re-enactments and events to mark the anniversary of the 1745 Battle of Prestonpans included Walking the Riggonhead Defile, the capture of Cockenzie House and the flight of the redcoats to Pittenweem from Morrison's Haven. As the Trust's contribution to The Homecoming, to coincide with The Gathering of the Clans in Edinburgh July 25th/ 26th, an Exhibition was arranged that told of each clans role with the Prince at the Battle of Prestonpans September 21st 1745. A series of associated activities was provided and the Trust was delighted to welcome the Camerons from New Zealand for the re-enactment of the incident in Tranent churchyard on September 20th 1745. The schedule was carried forward in consultation with the host Regiments The Glenbuckets, 77th Montgomeries and Lace Wars. It began with the Proclamation of King James VIII at Edinburgh's Mercat Cross, continuingwith the Council of War at Duddingston, the March through the Riggonhead Defile, the mortal wounding of Colonel Gardiner at Bankyton House,the final moments of the battle in Cuthill Park and the redcoat escape from Morrison's Haven.. The 18th and 19th of September 2008 saw a 'Battle Symposium' taking place at Prestonpans Community Centre including the presentation of The Battle of Pots & Pans on the evening of 18th. Cameo re-battle enactments were given on the 19th and 20th of September 2008 at Duddingston and in Prestonpans. September 17th saw The Proclamation of King James VIII at the Edinburgh Merket Cross and a Reception and Exhibition at the Scottish Parliament at Holyrood. September 21st was the 262nd anniversary of the famous 1745 Battle of Prestopans - Bonnie Prince Charlie and his Jacobite army's greatest victory! View the anniversary programme for the event and celebration schedule @ Holyroodhouse Palace ,the Riggonhead Defile, Colonel Gardiner's Last skirmish and Cockenzie House. The National Trust for Scotland also presented a lecture. The East Lothian Courier reported on the up coming 262nd anniversary celebrations of the Battle of Prestonpans beginning on the 21st and ending on the 22nd September. The article is split over three pages and viewable via the links below. 2007 East Lothian Courier - Reporting on the Battle of Prestonpans Anniversary Re-Enactment. 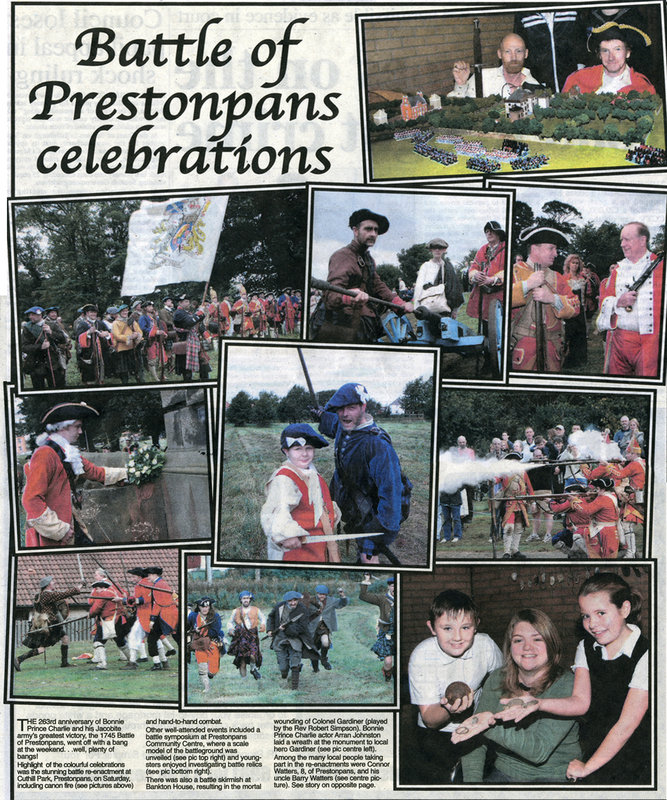 The East Lothian Courier reports on the successful 262nd anniversary celebrations of the Battle of Prestonpans over the weekend of the 21st and 22nd September. This article can be viewed by selecting the link below. This re-enactment was presented by East Lothian District Council and organised by the District Library Services to commemorate the 250th anniversary of the Battle of Prestonpans.